bl.uk > Online Gallery Home	> Online exhibitions	> Asia, Pacific and Africa Collections	> Temple Of Vishveshwur, Benares. Plate 8 from the third part of James Prinsep's 'Benares Illustrated'. Prinsep (1799-1840), an antiquary and colonial administrator was assay master at the Benares Mint between 1820-30. 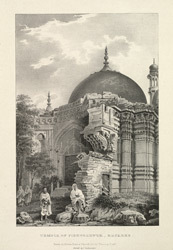 The lithographs published in this collection were based on his original sketches of the various views of the 'holy' city of the Hindus. The temple of Kashi Vishwanatha stands in the centre of the city of Benares and enshrines the Hindu god Shiva as Vishwanatha, 'lord of the universe'. The original temple was located across the road until Aurangazeb destroyed it in the late seventeenth century. The present temple was built by Ahalya Bai Holkar of Indore in 1777. The dome above the sanctum sanctorum was gold-plated in 1839 by Maharaja Ranjit Singh of Panjab, years after Prinsep made this sketch of the temple.